One of our favorite things about Owl's Flower is writing and drawing Herne in his screech owl ("Dumb Baby") form. While Herne is not necessarily highly dignified to begin with, the owl is both cute and a way for him to express himself a little more plainly. But... and I know this will come as a shock to a lot of you... neither of us actually owns an owl. There are no owl cafés near us, and around our respective necks of the woods it's generally not done to keep wild birds as pets. So when it comes to screech owl behaviors, we don't have a 24/7 local source to turn to. 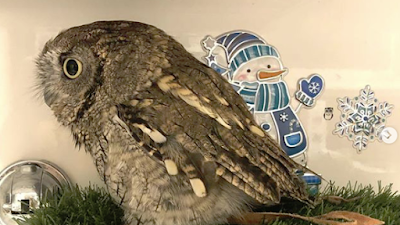 We do, however, have an online source, and one that's become our sort of real-world stand-in for Dumb Baby as we write: Kuu, a Western Screech Owl living in Japan. We first found Kuu on Vine (remember when that was still a thing), wearing tiny hats and getting generally confused by videos of himself. Occasionally, his owner would post the latest iteration of one particular habit: the owner twiddling his fingers to offer scritchies, and Kuu bounding down his perch to accept them. Kuu's owners videos include the owl flying around the house, acting judgy about toys, taking baths in bowls of water, and generally being a big silly baby. The sounds Kuu makes in the videos—the contented little trills and the occasional big loud hoots—also help us "hear" what Herne in owl form sounds like. Incidentally, Kuu has a housemate now: a Spectacled Owl named Pon who's also fun to watch. So if you're ever curious what exactly it would look like to have owl-type Herne hopping around Iris's house, pop over to @kuuowl on Twitter. Because, yeah. That's what we're working from. The vids are also stellar for bad mood days. Seriously. Just try to wear a frown when that little nerd is riding around on a feather duster.